It’s no secret that in order for a hockey team to achieve success, a lot of things have to be right. Of course the individual players have to have the requisite skills, but once those boxes are checked the hard stuff arises. Coaches are challenged to turn a disparate group into a functioning team that leverages individual skills to form a cohesive functioning whole that’s greater than the sum of its parts. And while diversity of skill sets is essential—a hockey team loaded with offensively gifted goal scorers but deficient in capable defensive forwards will likely struggle—what about the interpersonal stuff that determines so much? Team success largely depends on mutual respect, common purpose and uncommon selflessness. In other words, to a large extent, team success depends on intangibles. We value what we focus on. For young hockey players, the most visible validation of their worth at the rink lies in their goals, assists, penalty minutes, maybe plus/minus, and for goaltenders, save percentage. Players (and parents) definitely use ice time as a yardstick. Ditto special teams time. These things count because hockey counts them. 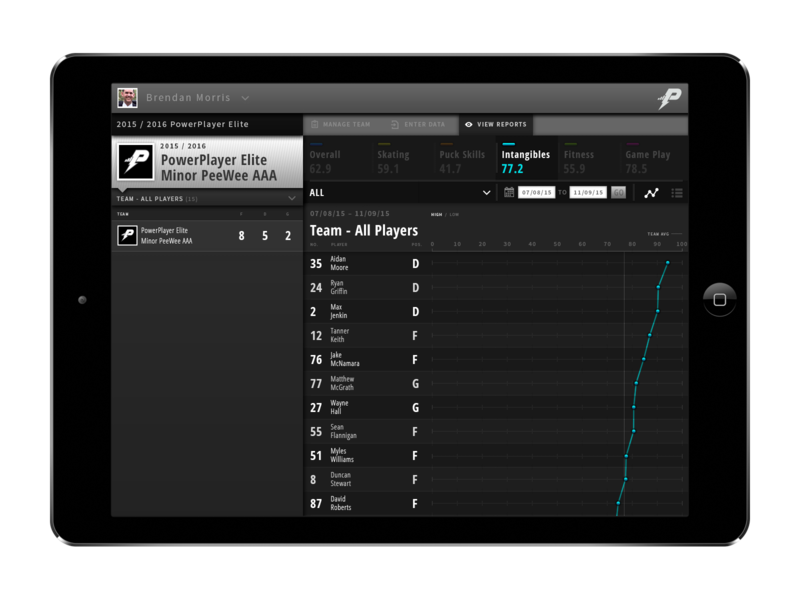 But now, PowerPlayer makes it possible to count the things that not only make kids better players, but better people. By scoring and visualizing intangibles, PowerPlayer elevates them to a place of importance in the mind of the athlete. An individual’s intangibles scores should serve as a constant reminder that personal traits might just play as much a role in them achieving their goals as being able to put a small rubber disc into a tiny opening between a goaltender’s shoulder and the crossbar. And over time, their maturity as people and players becomes an asset that will help them get where they are hoping to go, in hockey and in life. Recognition and encouragement go a long way. And for coaches who are working with young athletes, the question has to be asked: can intangibles be coached? It’s a good bet that every parent believes they can be, but we believe that they should at the very least be recognized and encouraged. Consideration for others, sportsmanship, competitive spirit, resilience in the face of adversity, selflessness and commitment are all desirable attributes in hockey players. But coaches who can help young players learn the behaviors and traits that make them successful teammates are really helping them become better people.